A Pes Cavus foot is a condition in which the foot has a very high arch. Because of this high arch, an excessive amount of weight is placed on the ball and heel of the foot when walking or standing. Cavus foot can lead to a variety of signs and symptoms, such as pain and instability. It can develop at any age, and can occur in one or both feet. Pes Cavus often caused by a neurologic disorder or other medical condition such as cerebral palsy, Charcot-Marie-Tooth disease, spina bifida, polio, muscular dystrophy, or stroke. 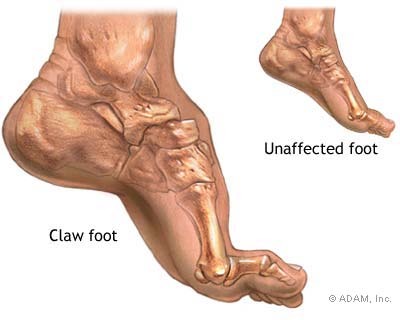 In other cases of cavus foot, the high arch may represent an inherited structural abnormality. Can You See or Feel the Signs? Some people with cavus foot may also experience foot drop, a weakness of the muscles in the foot and ankle that results in dragging the foot when taking a step. Foot drop is usually a sign of an underlying neurological condition. The cavus foot may be rigid or flexible in nature. Exercises that target the calf muscles as well as the sole of the feet can do a lot in loosening and relaxing this area of your legs and feet to help you become more flexible. The connective tissues at the bottom of your foot can be loosened by stretching to balance out the tight ligaments found at the top of the arch of your foot. Apply gentle resistance around the areas of your toes using a towel or resistance band and pull it back slowly. Bend your toes as far back as possible and hold the position for about 30 seconds. Place your toes on top of the opposite knee to create the number “4” figure with your legs. Hold this position for another 30 seconds and do it with your other foot. This effectively stretches your hips. For strengthening, stand barefoot and try to pick up golf balls with your toes. Hold the ball for about 20 seconds before releasing it and trying it with the other foot. Use a chair if you have problems with your balance. If you have weak muscles or recovering from injury, use a washcloth instead of a golf ball. You can also stand on the ball of your foot to stretch the ligaments in your toes while strengthening your ankles. Do this for at least 10 seconds. Specialists can provide you with insoles that can help boost the support from your shoes and address possible biomechanical issues with your foot. These can be custom-made or bought ready-made depending on your needs. Seeking professional advice is one of the best ways to address problems with high arches. Customised devices can be produced by specialists so they can easily fit into your shoes and deliver increased cushioning and stability. Bracing can also help in effectively managing foot drop by stabilising your ankles and feet. Shoe specialists highly recommend neutral shoes because of the constant density & support of the midsole and also the stability of the outsole. Motion control shoes are designed to prevent pronating or rolling in of the foot, so are generally not suitable for a supinated (high arched) foot. Seeking the advice of shoe specialists can allow you to benefit from shoe modifications to address the problem of high arches – e.g having a wider outsole base for more stability or high-topped shoes/boots that provide excellent ankle support. Wearing the wrong type of shoes will definitely only make things worse. Understanding is half of the battle; the other half is following the recommended solutions to help you overcome high arched foot problems. Call into a Foot Solutions store near you today, to see how we can help you keep you high arched feet more comfortable.